T293 opens its new exhibition season with a solo show by Dan Rees (UK, 1982). After distinguishing himself with the project “Home For Lost Ideas” (www.homeforlostideas.org), which gathers together the projects never carried or ‘lost’ by over one hundred established international artists, Dan Rees opens his first one-man exhibition in Italy. The installation Something To Fill That Empty Feeling comprises of three 16 mm film projections played on a continuous loop. The first film being projected on to the wall at the rear of the gallery space, the second and third films are screened on the sidewalls of the room respectively. Made in sequential order, and each a few days apart, all three films record the empty gallery space, from the exact same location. 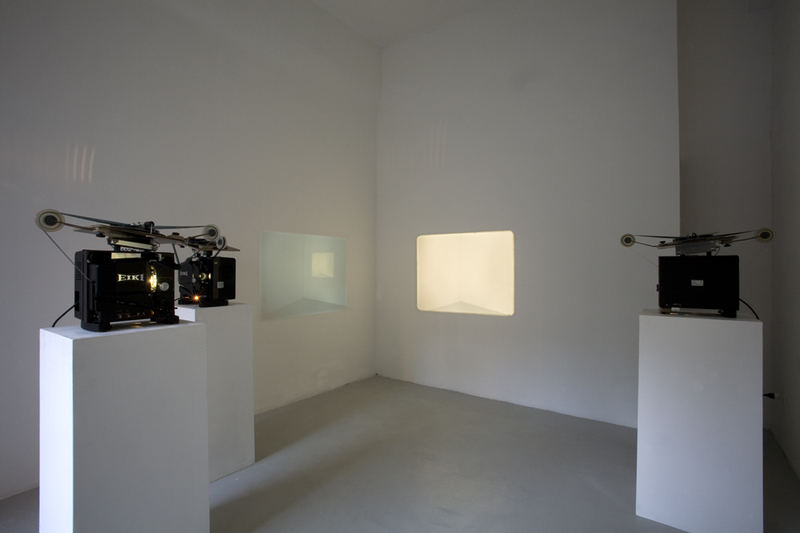 The second film however also captures the activity of the first film projection as does the third with the previous two, thus the films fill up one by one with the ‘emptiness’ of the last. The contents of the work of art becomes the space itself , which undergoes the adding of several narrative levels. The use of recognisable forms and subjects drawn from the Art world is a practice that the artist often exerts, highlighting uncertain aspects, clichés, and that which may make the critical sense of the spectator grow. The space-time trend of the projections assumes a spiral dimension that corresponds to a perceptive suspension, which reveals the failure of the immateriality of Art to keep up with its market. This triggers an attitude of challenge and intellectual adventure that represents one of the deepest motivations of the latest generation of artists.